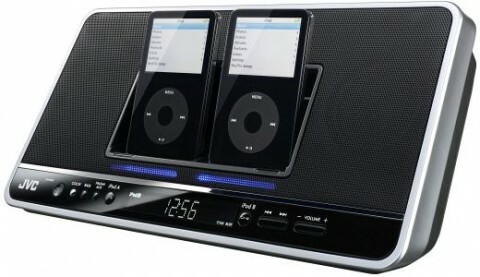 At the 2008 Consumer Electronics Show, JVC introduced the NX-PN7, a double-barreled iPod dock. The dual dock NX-PN7 accommodates two iPod players side-by side, charging them simultaneously and offering playback from each through the dock‚Äôs speaker system. Supplementing iPod playback is an AM/FM tuner, a clock and timer. In addition, there‚Äôs an analog audio input for connecting other devices for playback. While the player can charge his ‘n’ hers iPods, you may still have to fight over the remote. An included remote features dedicated iPod control keys that simulate the iPod control wheel layout, letting you shuffle, repeat, scroll and select songs from the iPod menu. The NX-PN7 should be available in April and is expected to retail for $149.95.